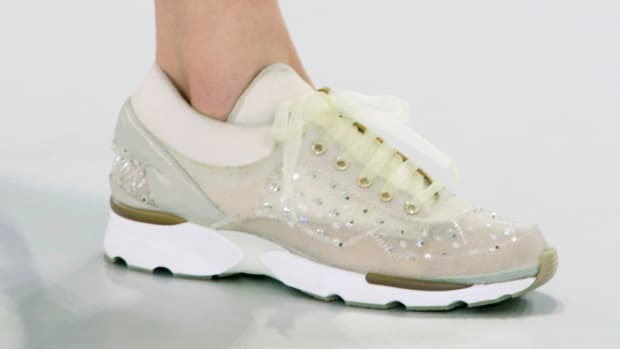 Slip-on sneakers, like other "ugly shoes" of the '90s and early 'aughts -- and sneakers more broadly -- are having a moment. And any time comfortable, functional shoes are having a moment, one should take advantage. Sometime during the long haul that was fashion month -- perhaps it was the day I walked nearly 10 miles between shows in London, or the day that Lucky market editor Laurel Pantin wore these wonderful Mother of Pearl shoes with a chunky white knit and a plaid Celine skirt -- I finally fell for slip-on sneakers. They, like other "ugly shoes" of the &apos;90s and early &apos;aughts -- and sneakers more broadly -- are having a moment. And any time comfortable, functional shoes are having a moment, one should take advantage. I&apos;ve been coming through the catalogs of online retailers for the past week and created a shopping guide to help you find a beloved pair for spring: whether you&apos;re into black, white, solid hues, prints, metallics or embellishment. Prices range from $21 to $1,325. As the Fashionista office can attest, I have been obsessed with slip-on sneakers lately. After combing through hundreds of styles, I chose these.